Read all about the 16,000 UC administrative professionals who are organizing for union representation in the UPTE Update, fresh off the press. As management moves ahead with “shared services” centers, reorganizations, and pension changes that will dramatically affect us, APs are organizing for a place at the bargaining table. If you’ve an AP, your last chance to support UPTE representation is fast approaching. Sign an UPTE card here. If you’ve already signed, ask a colleague to do the same! The California State University system proved again that it can match UC scandal for scandal. The Monday Memo has been following the failure of the CSU trustees to rein in excessive pay for their executives. Now California Watch is reporting that CSU has spent $2 million in the past ten years to renovate the homes of campus presidents, including giving the incoming CSU Fullerton president a $300,000 home makeover. UC is “widely recognized as perhaps the best example of what public universities could be,” writes the New York Times, but it is under threat of extremely damaging cuts if voters don’t pass a proposal to increase taxes this fall. A Los Angeles Times poll last week showed strong support for the measure, drafted by Governor Jerry Brown in coalition with unions and community groups. 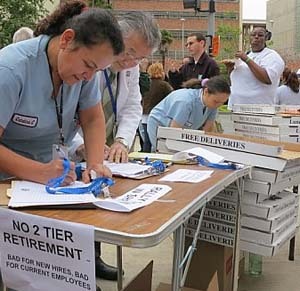 UPTE's health care professional members in sign petitions against UC's two-tier pension proposals. Several UC unions will be bargaining over the proposed changes soon. Both houses of the California Legislature have approved separate measures to give tuition relief, through tax breaks, to middle-class students at UC and CSU campuses. One of the measures, the Middle Class Scholarship Act sponsored by Assembly Speaker John Perez (D-Los Angeles), if passes by both houses, would save California’s students big bucks while closing corporate loopholes. Meanwhile, state Senator Michael Rubio (D-Shafter) has proposed a constitutional amendment to limit out-of-state enrollment to no more than 10 percent of undergraduates. UC has been increasing its out-of-state students, who pay significantly more in tuition, as one strategy in dealing with state budget cutbacks. The UC Berkeley chancellor asked the senator to withdraw his proposal. The third leg of California higher education under the state’s Master Plan, the community college system, is suffering severely from California’s budget crisis and is looking at having to close some campuses, especially if the governor’s tax initiative does not pass in November. Twelve hundred faculty at three California community college campuses have voted overwhelmingly to join UPTE-CWA, according to a front page article in the latest UPTE Update. The part-time faculty at Butte Community College in Chico, College of the Sequoias in Visalia and Mount San Jacinto Community College will transition into UPTE-CWA with support from their previous local, CWA 9414. Why it matters to fight for adequate pensions: a recent report by the Employee Benefit Research Institute has found that increasing numbers of Americans are spending their retirements in poverty. Between 2005 and 2009, poverty rates for people 65 to 74 climbed from 7.9 to 9.4 percent, with an even steeper increase for those 75 and over. Medical costs are one of the biggest factors sinking retirees into poverty. A REMINDER: Tuesday, June 5 is election day in California, so get out there and vote! Polls open at 7 am and close at 8 pm. You can find recommendations on all the candidates and propositions at the California Federation of Labor’s website.